Find the desktop PC that’s right for you using our easy-to-follow buying guide. We guide you through the most important things to consider before you purchase, providing a range of tips and useful info as we go. Look out for the ‘Our Experts Love’ range to find desktop PCs that showcase the latest features. And of course, if you want to see what’s on offer for yourself, head to your nearest store and we’ll be happy to help find the right desktop PC for you. The operating system provides the framework for how you interact with your PC, and is essentially what you see when you turn on your computer. Small changes in the way it’s designed change how your computer looks, how and where you access files, plus the programmes and software you can run. There are three main operating systems, each with their own perks and drawbacks. Windows is by far the world’s most common operating system, so chances are you have used at least one version of it in the past. It’s simple to use, as files and programmes are easy to save, manage and access, which makes Windows a favourite of offices the world over. If you’re looking for a new PC for university, gaming or just a basic home computer, then Windows is a great choice. Windows has also brought out its own line of cutting-edge computers, which are designed to get the best out of the operating system, and are getting better with each new release. Well supported: Windows is so popular, most software, accessories and components are designed to work perfectly with it. Great for Gamers: All the most popular PC games are designed to work with Windows, making it the leading choice if you’re looking for a serious gaming machine. - Drawbacks: If you've never used a PC before, it can take a while to learn the layout and navigation. OS X is Apple’s much-loved operating system. It is available exclusively on iMac, Mac Pro and Mac mini desktops, along with the MacBook laptop series. It features a bright, stylized desktop which provides ease-of-use and security, making it the preferred choice of professionals in creative industries, and casual home users that prefer a simpler, more intuitive layout. Optimised for design: ome of the most popular design software, such as Photoshop and InDesign, works best on OS X, giving you improved performance and a smoother experience. Works best with Apple: OS X is designed to work seamlessly with other Apple devices, so if you have an iPhone or iPad, sharing files, songs, contacts and apps between them is simple. They share a similar layout too, so it’s much easier to use if you already have an Apple device, such as an iPhone. - Drawbacks: OS X is limited in its choice of software and accessories, so if you want to use something specific and it’s only available for Windows, you will need to find an alternative. Google’s Chrome OS is web-based and designed for accessing online content as quickly and as easily as possible. You don’t get any of the main applications or programmes as found on OS X or Windows, but you do get a fast and simple way of getting online. Google also offer their own online versions of popular desktop programmes, such as Google Sheets for Excel, or Google Docs for Word. Fast, easy web access: Chrome OS is built to offer smooth, fast access to the Internet, the Cloud and web applications, making it great for web-based computing and collaborating with others, as online versions are updated instantly. Google Play: You can access more than one million Android apps courtesy of Google Play, the app store for Android smartphones and tablets. You can also access music, movies and TV shows plus more. - Most PC software isn't compatible with Chrome OS, so it’s only a great choice for web-based computing using Google suite applications such as Google Sheets, Google Docs and Google Photos plus more. The form factor refers to the size, shape and style of your PC. There’s a wide selection to choose from, and each size and style has its own benefits. What’s right for you depends on what you want from your PC, and how much space you have. Tower PCs are the classic, full-size PCs you normally store underneath a desk. Though recent versions are smaller than their more bulky equivalents a few years ago, they are still larger than more modern mini-PCs or laptops. Go for a tower PC if you’re looking for more power to run design software, advanced games or film making applications. Thanks to extra internal space, you can also customise and add upgrades much easier, plus enjoy a wider variety of more specialized software, from the latest graphics cards for immersive gaming, to professional music-making software like Pro Tools. All-in-one PCs have a tower PC setup built-in to the monitor, which takes up less room and gives you more flexibility. Some all-in-one PCs, such as Windows, feature touchscreens like on a tablet, giving you a more responsive way to control your PC. Simply touch, tap and swipe the screen to navigate the web and your applications. Mini-PCs are a new breed of PC. Despite being the smallest available, they work just like their full-sized counterparts, with the same ports, features and ability to run advanced software. Mini PCs are great for everyday computing tasks, such as typing essays and browsing the web, but don’t have the same room for high-performance components or upgrades as larger tower PCs. As technology improves, however, mini-PCs are catching up fast with their larger counterparts. With powerful processors and dedicated, enhanced graphics cards, gaming PCs are designed to give the ultimate gaming experience for the most modern, advanced games. Every gaming PC we currently sell will play any PC game available today. The main difference between the more expensive versions and the more affordable is that you’ll get better visuals and higher frame-rates for a more immersive experience. If you have a 4K TV or monitor, you can also enjoy high-definition visuals on-screen for more lifelike gaming. The processor is the central brain of your computer, and is what makes the computer respond to your requests. Certain software is more demanding on your processor, so you’ll need to check the minimum requirements of your preferred software before buying to ensure you have the power you need. You can check both product pages on our website, or ask one of our in-store colleagues who will check for you. Software packages will also outline system requirements before you purchase them. Generally, the more cores a processor has, the more information it can compute, and the faster it is. Every PC we sell has at least a dual-core processor. This means it can process more information, giving a more responsive experience when you’re browsing the web, opening files or playing games. Quad-core processors are more powerful and great for demanding software, such as video editing and music production applications, which are now designed to work best across several cores. Clock speed refers to how fast your processor runs, and is measured in GHz. The higher the clock speed, the faster your computer will be at opening applications and loading software. Intel™ processors also offer Turbo Boost, while AMD has Turbo Core technology, which injects power solely for the task you are working on. This means the processor uses power more efficiently, and gives out less heat when it’s not running at maximum. The memory cache is where tasks are stored before they are handled by the processor. The more memory cache you have, the more demanding tasks you can perform on your computer. The only time you need any more than 4 MB is when want to run professional-level creative software, like Cubase or Photoshop. What is the right processor for me? Should I go for an Intel® or AMD processor? There isn’t a huge difference between the two brands, unless you’re running professional-grade software. To get the best computer for you, you’re much better off checking whether your PC has the features, hard drive and design to suit your needs. Intel™ processors are known to be slightly more powerful than AMD. If you're looking for fast, smooth performance, an Intel® Cor™ i5 or i7 processor is a great choice, and can be found in many of the more high-end computers available today. These processors have Hyper-Threading technology, which doubles the performance of each core. This means a dual-core processor with Hyper-Threading offers the power of a quad-core processor, giving you a huge boost in performance. AMD produce great APUs, or accelerated processing units. They combine a fast processor with a graphics card in one powerful chip, so you get awesome graphics on games and movies plus a fast experience when you’re switching between applications. You can also get a dedicated graphics card for both processors, with the sole job of handling image and graphic quality for games, video making and graphic design. RAM stands for Random Access Memory, and it’s where requests made by you are stored before the processor is ready to start working on them. The more RAM you have, the more you can do at the same time, such as playing music while switching between an Excel file and the Internet. When you perform an action on a computer, anything from clicking open a Word file to opening your web browser, the request is sent to your RAM. When the processor is ready, it picks up the request and makes it happen. With small actions, this happens instantly. Big software applications or having lots of open screens at once, however, fills up your RAM quickly. That’s why modern PCs have lots of built-in RAM and fast processors to cope with a backlog of requests if you’re running intensive applications. Storage refers to the built-in memory you have to save documents, photos, music, software, apps plus everything else you want to store. The hard disc drive is the central storage feature on most PCs, and is available in a variety of sizes - from 500 GB to a massive 3 TB. What size is right for you depends on how much music, files, games and other content you have. Solid-state drives don’t store as much as a hard disc drive or other storage devices, but they work much quicker, so are great for demanding graphics software or HD games. They normally work alongside a hard disc drive, so you can install games and software on them for the best performance without taking up overall storage capacity. A solid-state hybrid drive gives you the memory capacity of an HDD with the smooth, fast performance of an SSD. An SSHD can loosely be described as ‘smart’ memory, as it learns which content you access most and stores it ready for you, offering instant access and a more responsive feel. All-in-one PCs come in a range of different screen sizes and styles with an array of awesome features. You’ll be able to find an all-in-one PC whatever your tastes and available space, as they range from a compact 19” to a huge 34”. Go for a larger screen if you need it for work and require access to range of pages or applications. If space is at a premium, then there’s a great range of powerful mini all-in-one PCs to choose from. 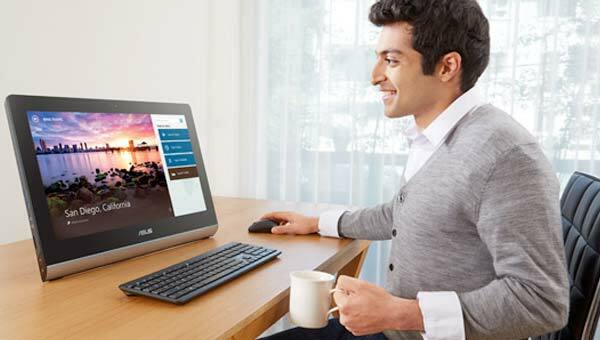 All-in-one PCs are available with HD or Full HD screens. Which screen resolution is right for you depends on how you use your PC. If you watch lots of movies or play lots of games, then Full HD gives you more detailed visuals. If you use your PC for average everyday tasks, however, then a normal HD screen will be sufficient and save you money, too. Touchscreen PCs let you simply tap, swipe and pinch the screen to do everything from browse the web to playing fun online games. It’s super intuitive to use, so everything you do is fast, simple and responsive. Whether it’s design, software or extra storage, there’s a range of smaller details to think about when trying to find your perfect desktop PC. Many modern desktop PCs have attractive, contemporary styling, with smooth, rounded edges, sleek metallic builds and minimalist modern colouring. If you’re after a computer that looks and works great, then the best option is modern mini-PCs, which look at home next to the latest sleek tech devices, like smartphones and smart TVs. Contemporary all-in-one PCs also look great, as they don't clutter your desk with cables and the slim bezels on the latest designs offer a clean, minimalist look, such as Apple's all-in-one PC, the iMac. You can also customise gaming PCs with cool colouring and lighting, which you can sync with some controllers for a truly unique look. Dedicated graphics cards deal solely with visuals, videos and games. PCs with high-quality, dedicated graphics cards can handle the latest games and visual media, plus video and image editing software. If you like any of these things, and do them often, then it really is a must. You’ll also need one if you want to connect a 4K or high-resolution screen, as you’ll need serious power to get the best imagery. A good tip is to look for a PC with a high-end NVIDIA GeForce GTX card, or one of AMD Radeon RX Vega series. Once you've chosen your new desktop, here are the best add-ons to think about. From antivirus and Microsoft Office, to photo editing and graphics tools, we can help you find any software you need to compliment your new PC. Our accessories range includes ergonomic keyboards, wireless mice, headsets, stands and more, to help you get a comfortable, enjoyable experience every time you turn your computer on. From large-capacity, portable storage, to a USB stick for carrying documents, you can find a range of affordable, reliable storage technologies to help keep your data secure. A home printer simply makes life easier. Look out for all-in-one printers, which also feature a scanner and copier for versatility. If you love gaming, we have loads of accessories to keep you playing at your best - from headsets to the latest mechanical keyboards. Bluetooth | Bluetooth connects two compatible devices together wirelessly, such as a tablet and a set of Bluetooth speakers. DisplayPort | DisplayPort is a port that lets you connect laptops, tablets and desktop PCs to a monitor or TV. It is much smaller than HDMI, so is used on ultra-thin laptops, tablets and gaming PCs that support multiple monitors. DisplayPort supports Full HD and 4K video, along with high-definition audio. DVI | DVI stands for Digital Visual Interface. It is a common way to connect desktop PCs and monitors. It transmits Full HD video without audio. Ethernet | Ethernet is a port that lets you connect your PC to the Internet via a cable. There are two speeds: 10/100 Ethernet and 10/100/1000 Gigabit Ethernet. The numbers refer to the maximum data transfer speeds they support and are measured in Mbps. Super-fast Gigabit Ethernet is great for streaming HD content and playing games online. Graphics card | A graphics card is a processor dedicated solely to handling the visuals on your PC. Hard disc drive (HDD) | An HDD is a standard hard drive for storing files, the type fitted to most desktop computers. HDMI | HDMI stands for High-Definition Multimedia Interface. It’s a port that lets you connect your device to a TV or monitor. It can transmit Full HD video and audio. Memory / RAM | Random Access Memory (RAM) stores tasks before they’re picked up by the processor. More RAM lets you do more at once, such as listening to music while you browse the Internet. Motherboard | The motherboard, or main board, is the central component in your PC. All other components connect to it, including the processor, RAM, storage drives and graphics card. Operating system | The software your PC runs on - either Windows, OS X, or Chrome OS. Optical disc drive | An optical disc drive is a DVD or Blu-ray drive. It lets you play and write discs on your laptop or desktop. Power supply | A power supply can either be external (in laptops and tablets) or internal (desktop PCs). Power supplies in desktop PCs are rated in watts. Processor cores | A core is the part of the processor that processes information. Cores come a variety of values, including dual-core, quad-core and octa-core. Processor | The processor is your PC’s brain. It processes and manages everything you do on the computer, so a faster processor gives you a faster computer. Solid-state drive (SSD) | SSDs are storage devices that are faster than hard disc drives (HDD), but have a lower storage capacity. Solid-state hybrid drive (SSHD) | Solid-state hybrid drives combine the speed of SSDs and the capacity of SSHDs, although aren’t quite as fast as an SSD. They can intelligently measure and then predict which content you like to access, and have it ready for you when you’re most likely to access it. USB | USB stands for Universal Serial Bus. It is a universal port for connecting accessories, such as a mouse or keyboard, to your PC or tablet. VGA | VGA stands for Video Graphics Array. It is an older connector that laptops and desktops use to connect to monitors and TVs. On modern PCs, it has been replaced by HDMI, DisplayPort and DVI. It cannot transmit HD video or audio. WiFi | WiFi is a wireless connection to the internet. It is the standard way computers, plus other connected devices, connect wirelessly to the web. AC WiFi is the latest version of WiFi, offering a fast, stable connection between your device and router.